Ribbon Bow, originally uploaded by fmirela. 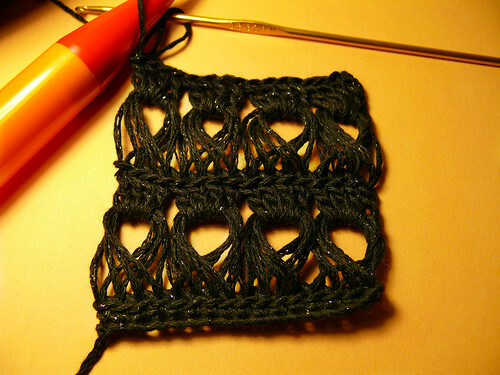 This was a very quick crochet indeed, one could finish it in a day or a weekend. I really enjoyed crocheting this, especially because of the speed, you get to see the airy fabric forming in no time. While making this everyone laughed at my huge orange knitting needle and asked what is the purpose of such a lacy transparent item. My aim was to create a sexier version of a vest, something that suggests a corset style, with a baby doll bottom, close fitted waist. 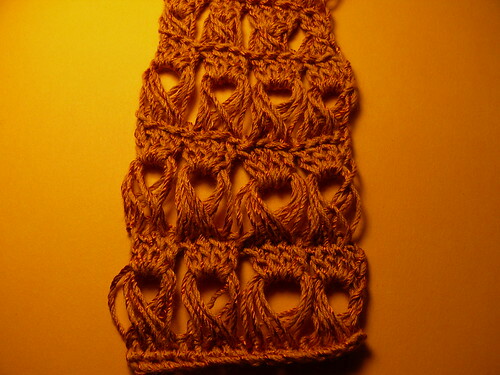 A narrow ribbon passes through a row of double crochet stitches, under the bust to emphasize the empire waist. The shirt and pants I sewed a long long time ago from La Mia Boutique magazine and I plan on reusing those patterns someday. They offer this lovely jacket pattern to apply you new learned skill. Be creative “Samantha”! you can even use your broomstick to design your own fabrics! I can’t wait to find the perfect yarn for this and start crocheting!